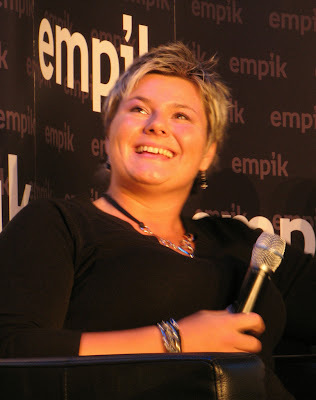 Kamila Skolimowska (4 November 1982 – 18 February 2009) was a Polish hammer thrower. She was known for her Olympic gold medal in Sydney 2000, which made her the youngest Olympic hammer champion, as well as for her two medals from the European Championships. Her personal best throw, and Polish record, was 76.83 metres, achieved in May 2007 in Doha. She died on 18 February 2009 in Vila Real de Santo António during Polish national team training camp. She was born in Warsaw. Skolimowska first made herself known at age fifteen, when she won the hammer throw event at the 1997 European Junior Championships; the first time hammer throw was staged at the European Junior Championships. She was actually fourteen years and 264 days at the time, and had become Polish national champion and record holder the year before. Her personal best in 1997 was 63.48 metres. She improved her personal best to 66.62 metres in 1999. She also finished seventh at the 1998 European Championships, won the 1999 World Youth Championships and finished twenty-first at the 1999 World Championships. At the 2000 Summer Olympics she won a gold medal in the hammer throw, with a new personal best throw of 71.16 metres. At age 17 years and 331 days, Skolimowska became the youngest Olympic hammer champion. As it was the first time that the women's hammer throw was staged at the Olympics, she also set an Olympic record, which stood for four years. She received the Polish Golden Cross of Merit for her achievement. In the 2001 season, she finished fourth at the 2001 World Championships in Edmonton, with a throw of 68.05 metres. One month later she improved her national record to 71.71 metres, which was enough to win the IAAF Grand Prix Final in Melbourne. In 2002 she took her first championships medal since the Olympic victory, at the 2002 European Championships. Throwing 72.46 metres to take the silver medal behind Olga Kuzenkova, she almost improved on her 72.60 result achieved in June in Bydgoszcz. Toward the end of the season she finished fifth at the 2002 World Cup. Skolimowska did not set new national records in 2003 and 2004. In 2003 she finished eighth both at the 2003 World Championships and the 2003 World Athletics Final. In the final round of the hammer throw at the 2004 Summer Olympics in Athens she recorded a season best of 72.57 metres, placing fifth overall in the event. She again finished fifth at the 2004 World Athletics Final. In July 2005 Skolimowska improved her national record to 74.27 metres, the result being achieved in Madrid. Exactly one month later she won the gold medal at the Universiade, four days after finishing seventh at the 2005 World Championships. At the 2005 World Athletics Final she finished second. In 2006 Skolimowska improved her national record again; to 75.29 as she won the 2006 World Cup meet in September in Athens. The record crowned a successful year, with a bronze medal at the 2006 European Championships and a second place at the 2006 World Athletics Final earlier in the season. In 2007 Skolimowska improved with more than a metre, throwing 76.83 in May at the Super Grand Prix meet in Doha. She finished fourth at both the 2007 World Championships and the 2007 World Athletics Final. 2008, however, was an unsuccesful year. Her season's best was only 73.50, achieved in June in Warsaw. In the Olympic competition, she did progress from the qualifying round, but failed to register a valid mark in the final, ending in last place. She died at the age of 26 during a training session in Portugal, probably due to a heart attack or a pulmonary embolism.